HP TouchSmart Mother's Day & Grads Giveaway! Congratulations to our HP TouchSmart winner, Dot S. from Oakham, MA! If you're a Project Runway fan, you have seen the contestants using HP TouchSmart notebooks to design their fashion creations. The unique, convertible design offers a full-size keyboard and can also be used in slate mode as a sketchpad with a digital pen. Stay connected even as you cook up culinary delights in your kitchen. The touchscreen gives you quick access to recipes, demonstration videos and photos without the need for a keyboard or mouse. Use your TouchSmart in the family room as a media server. Scroll through music, videos and photos with a flick of your finger, and then send them to your TV using the built-in HDMI port. Turn the touchscreen into a canvas and bring out your artistic side with the included Corel Paint It! software. Rotate the touchscreen and fold it flat to turn your TouchSmart into an eReader using eBooks from Kindle, Barnes & Noble and others. With all these uses, the HP TouchSmart would make a great gift for Mother's Day or for a new graduate! So in honor of mothers and grads, HP is giving away a TouchSmart tm2 tablet PC (MSRP $899.99) to one lucky entrant! Then, tell us in a comment below what you would do with the HP TouchSmart if you are picked as the winner! Maximum of one entry per person. The giveaway will end at 11:59pm on May 4th, 2010. We will randomly select one (1) winner from the entries. No purchase is necessary to win. Void where prohibited. U.S. residents only. Click here for the full rules. I would use this for all my projects and cooking as I cook a lot of low fat foods due to health issues. I would use this super nice as our third computer. It seems like someone is always using the 2 desktops. This would be awesome to use when traveling! 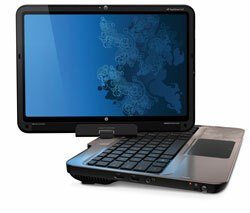 I would use the HP TouchSmart in my everyday tasks at the office. will always have something to do..love to read on one of those…thank you for opportunity to win . I’d love to keep this for myself to keep in touch with everything while I’m traveling, but my daughter recently returned to college and could really, really use it. I would use it as an eReader to read ebooks. I would use the HP TouchSmart to stay connected wherever I go. I would give it to my son who is a graphic design artist and doesn’t own a laptop.